This book covers state-of-the-art medical image analysis approaches currently pursued in autism research. 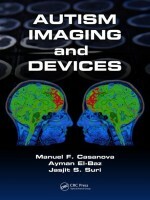 Chapters cover recent advances in diagnosis using structural neuroimaging. All aspects of imaging are included, such as electrophysiology (EEG, ERP, QEEG, and MEG), postmortem techniques, and advantages and difficulties of depositing/acquiring images in larger databases. The book incorporates 2D, 3D, and 4D imaging and advances scientific research within the broad field of autism imaging.